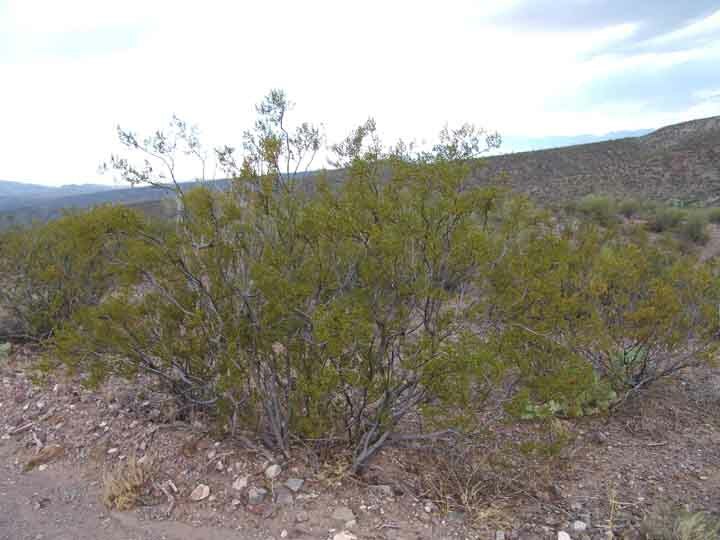 Sources: Brown, David & Charles Lowe, 1980, Biotic Communities of the Southwest, Republished by University of Utah Press, 1994; Brown, David, ed., 1994, Biotic Communities: Southwestern United States and Northwestern Mexico, Salt Lake City: University of Utah Press. 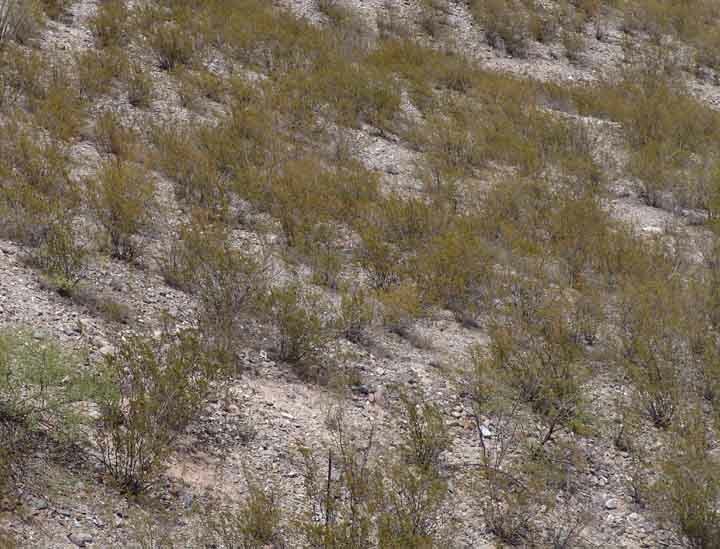 Below, a view looking downstream in Upper Pool Wash.
Below, fairly typical creosotebushes on the left and right terraces in Lower Hot Springs Canyon. All of these -- and they are quite typical plants in their overall shape and the distribution of branches and leaves -- seem quite obviously to be of the Sonoran Ecotype. 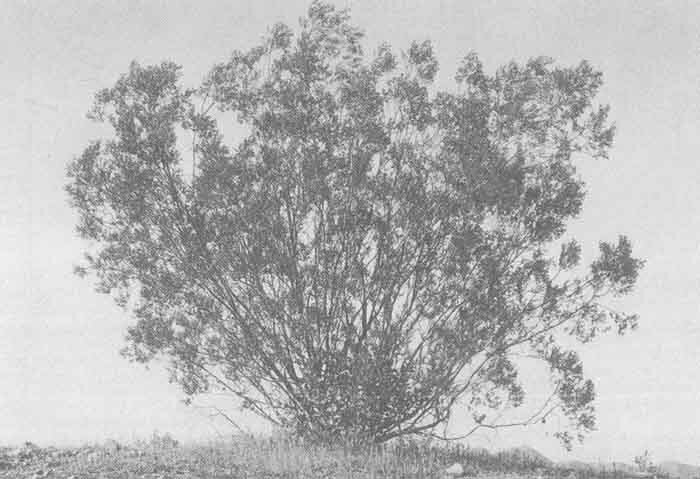 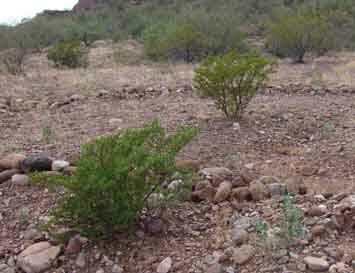 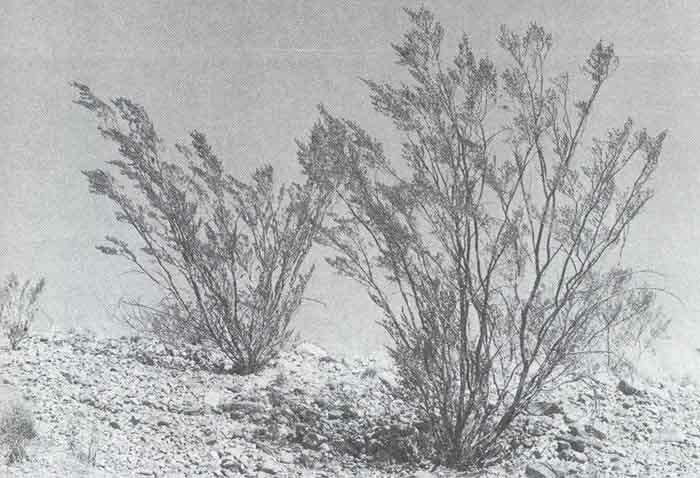 Even the very small creosotebushes we see have this character: at left, three small creosotebushes in the foreground near the section 8 gate on the Ridge Road; at right, two small ones in the foreground (some larger ones also visible in the background) on a terrace in Lower Hot Springs Canyon. 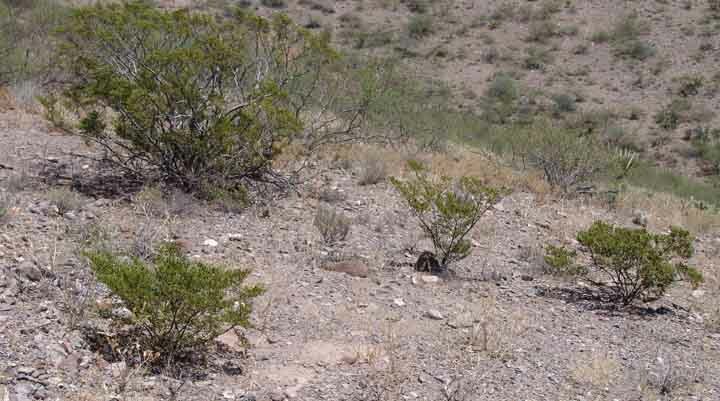 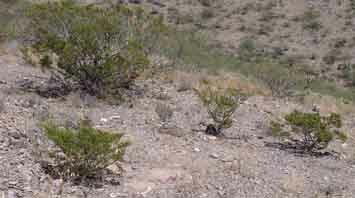 Compare these small plants with the small one shown at the far left of the top-left banner photo above, representing a small Chihuahuan ecotype. 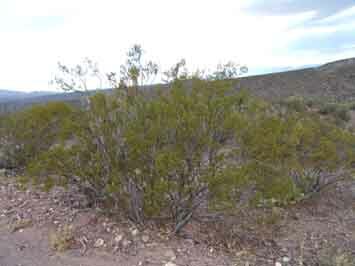 Of these small plants only the center one above left approaches the distinctive angularity and openness of the Chihuahuan. 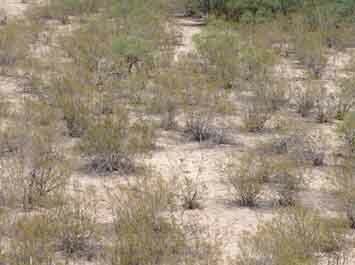 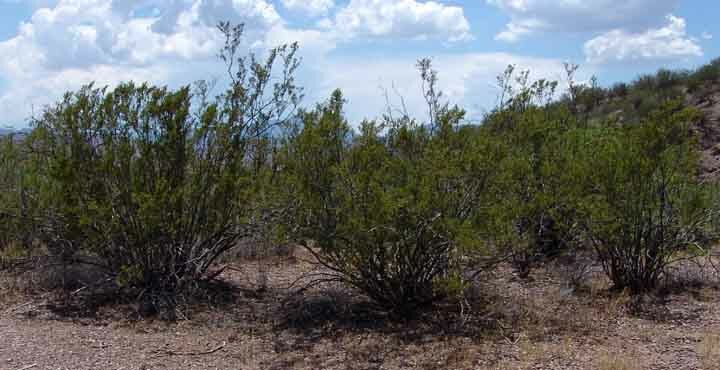 These plants share features distinguishing them from the Chihuahuan Ecotype as identified by Brown -- they have both denser foliage and a much less angular appearance. 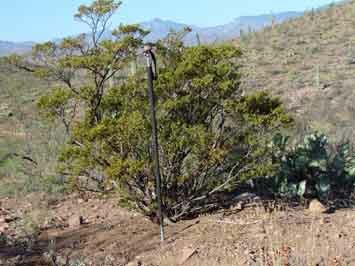 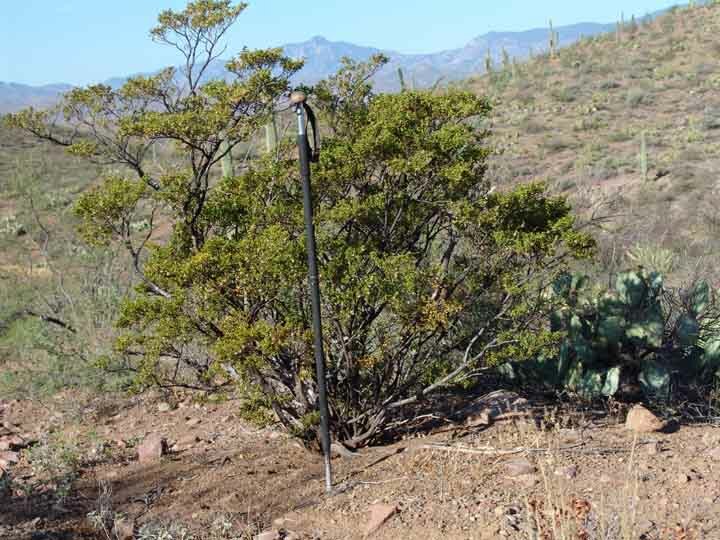 And while we have not conducted anything like a systematic survey, we feel considerable confidence in the statement that these are by far the more common appearances of creosotebushes in our area.